Hey guys Iron-Blooded Orphans is back and oh boy was it an episode, I don’t think we have had a string of three episodes like Lit by a Blazing Sun, Natural for a Human, and now Settlement ever for this series. It’s just go go go and after a couple high drama less action episodes we have one that is action and boy does it look good. Also I just wanted to say sorry for the slight delay in getting this write up out this week as Sunday was kind of a big day, lets just say GOAT! If you get that awesome, if not that’s cool too. So without further adieu lets return to space in Iron-Blooded Orphans Season 2 “Settlement”. By now I think we all know one of my golden rules is that it is always better to watch action then to read about it. Now do to the fact a bunch of the episodes run time is devoted to action this will likely be shorter then my usual fare, which I guess is good or bad depending on ones own personal perspective. However as the episode opens we’re treated to a little world building. Back on Mars Kudelia who we haven’t really seen in a while (Atra’s been stealing all the screen time) has been informed of what has been going on in space, since the main Tekkadan force moved out. Apparently Tekkadan has dissolved all contact with most of it’s allies, including Kudelia its assumed. Making them effectively a renegade organization once more, as it’s clear only working in the dark can Tekkadan find their revenge. Little by little Tekkadan’s fleet is growing. Moving on the episode officially opens with an epic space battle as the full force of Tekkadan’s fury is bearing down on Jasley’s JPT Trust fleet. Although as Tekkadan suspects this initial encounter is little more then bait forcing them to engage Jasley’s forces. Following which its revealed idIok will take Tekkadan from behind, a simple plan from simple men it seems. After which Jasley and idIok will go to Sasse and end Teiwaz for good, installing Jasley as the new head. Edit Fun Fact: IdIok’s voice actor, Nobunaga Shimazaki, is the dub actor for Prince Joffrey in GOT. Thanks Aznablesange! In sufficiently brutal fashion Mikazuki continues to make quick work of the opposing forces. Showing little if any effort as he slaughters all who stand before him. However he is not alone as Hush is right behind him now piloting the STH-20 Hekija the same suit used by Lafter and Azee (and based on context clues potentially Lafter’s suit itself), a suit far superior to the regular Shinden of Tekkadan. Showing Tekkadan’s faith in Hush’s skills. To which Julietta responds “that’s taboo”. We of course now this isn’t always the case and Julietta’s companion almost says as much. Likely referencing Vidar/omg-has-he-still-not-been-confirmed-as-Galleo-yet and the Graze-Ein. As Tekkadan continues to to obliterate the opposing forces pressure is building on Jasley to retreat... or do something, anything really by this point. Contacting the head of Teiwaz begging for help Jasley is in for a nasty surprise. Seeing through the admittedly juvenile plan of idIok and his foolish subordinate the Old Man has decided to let Tekkadan absolutely crush the conspirators against him. All the while simultaneously going over idIok’s head to Rustal Elion. Where both sides have agreed to look the other way regarding each others indiscretions, effectively cutting off the heads of both of his biggest rivals at the moment. Showing the “Old Man” can still play with the young pups rather effectively. Now while he feels like Tekkadan is a useless organization within Teiwaz due to their hot headed nature, he does respect their guts and determination to defend their Aniki. Once again showing a sort of Yakuza honour even among space pirates mafioso’s. As the pressure continues to mount Jasley bows to the pressure before him and contacts Orga. In a voice as cold as arctic wind Orga answers then, however Jasley is unable to keep his cool. Despite this the parlay was never to last that long anyways as Mikazuki drops outside of the bridge of Jasley’s flagship. 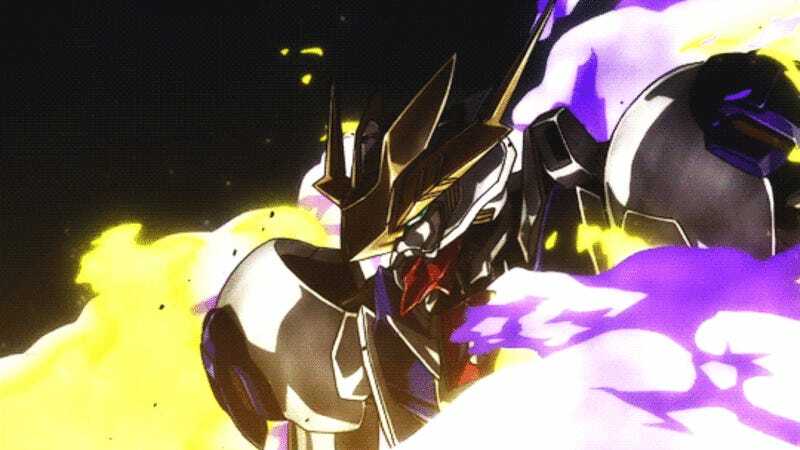 With the order “crush them” Mikazuki in quick and brutal fashion in a scene reminiscent of Gundam Wing uses the Barbatos Lupis Rex to smash the Bridge and end the pitiful existence of Jasley and all his crew. Granting the revenge Tekkadan so rightly deserved. As the episode comes to a close likely the biggest shift ever in Iron-Blooded Orphans begins to move into motion. All the dirty laundry of Rustal and idIok is revealed to the world by Gjallahorn Revolutionaries. Likely under the direct command of McGillis setting into motion his plan to reform Gjallahorn we learned of months ago. Of course such reform will see his biggest rivals death and him standing on top of the world. Tekkadan now without their biggest allies have decided to fight alongside McGillis and the Gjallahorn Revolutionaries. Their price - Mars. Considering this is what McGillis has long dangled before Orga’s eyes it is not a surprise Orga would remain fixated on the goal. This of course is the moment I’ve long been waiting for where Iron-Blooded Orphans FINALLY gets what it has long needed. War. Tekkadan as effectively a PMC was strong but never strong enough to change the world, with the power of potentially multiple Seven Star families alongside of them this sets up a battle field the scale of which the series has not yet seen. Let’s not forget Tekkadan/McGillis is now on a direct collision course with the Arianrhod Fleet widely regarded as the most powerful organization in the universe. Armed with illegal weapons of mass destruction and of course at least three Gundam frames. He does have a REALLY nice view. Yes this is it and in one quick flip of the table there is the possibility we are moving into the end game of Iron-Blooded Orphans. Which I was starting to wonder if we were looking at a third season, while still a possibility I can see multiple ways for the season and series to wrap up. This of course involves the story moving at a breakneck pace one I expect will be rather bloody for all sides involved. One of the best episode of Iron-Blooded Orphans deserves a pairing with it’s amazing OPing. Honestly we’re now four deep into these and this show just keeps excelling with their OPs/EDings. I’m really impressed by the music these might be some of the best consistently awesome singles a Gundam franchise have put out. Please note this is an extended version the official release is March 1st, 2017. PS: Some new IBO info out of the Model Scene that mysterious Gundam from from awhile back is called the Bael Gundam, Bael was one of the highest demons that the Gundam Frames are named after.